(OpenCarryTexas)-Video brought to you thanks to the 1st Amendment of the United States Constitution. A person asked me to review video of an encounter, and I believe it is worth using this to show how important some of our Constitutional rights are for the People of the United States. The officer says he received complaints from people who did not know the law about a person carrying a rifle. 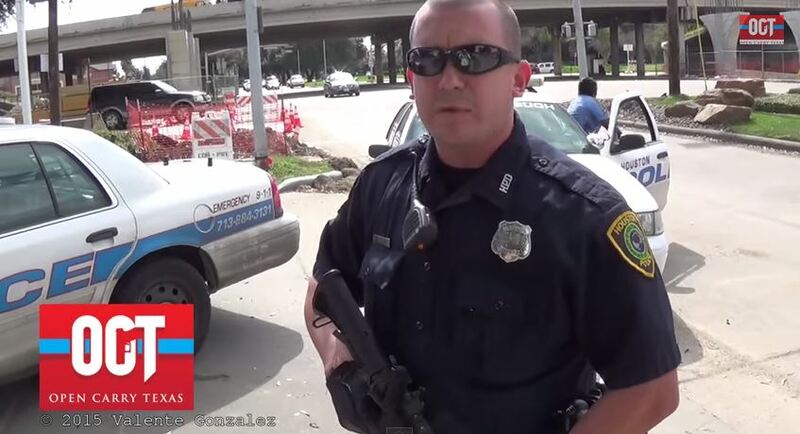 The officer said on video that he tried to explain to the public about the laws in Texas ,but as we see he ended up caving to the uniformed minority and went out to go and checkout the person anyway because a few people were offended by the sight of a gun. The government is supposed to protect our rights not hurt them because someone is offended. Thanks for trying Officer, educating the public on our rights is indeed hard work. Don’t be offended if someone does not want to talk to you, it is their right considering the reason our founding fathers saw it necessary to have this protection in our constitution you can find out more about it here. Posted in Current Events, Gun Law, WTF?!?! Could Firearm and Ammo prices drop under a Trump Presidency?